If you’re studying Brighton School of English, you may have already experienced some British Humour. What us Brits’ find funny is shaped by the long term relative stability of society here. Plus the consistently unpredictable yet mild weather. Themes of British Humour include the class system, sexual taboos and innuendos, puns and intellectual jokes. Sarcasm and self deprecation are typical as is dead pan delivery. Humour is often a tool to bury emotions and stifle controversy, as well as express distaste and intellectualism. Innuendo is the insinuation of something (usually derogatory) through an innocent veil of interpretation. It has been apparent in British entertainment since Beowulf and Shakespeare but was hugely popular in the 70’s. ‘Carry On’ films for example, although now seeming like unbearably infantile pantomimes obsessed with the borderline explicit, were actually regularly anticipated entertainment. 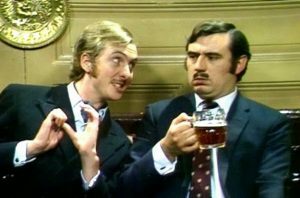 Sketch shows like ‘Nudge Nudge’ from ‘Monty Python’, took to mocking this comedy for its down right tactlessness. Innuendo is invariably related to ‘double entendre’, a word used for two meanings. A really interesting parallel is the similarities and differences between British and American humour, perhaps as the 2 main exports of television media. If you watch a few episodes of Ricky Gervais ‘The Office (U.K)’ you’ll find moments of unbearable tension. Social situations that are so uncomfortable, you feel both distaste and pity for those involved. 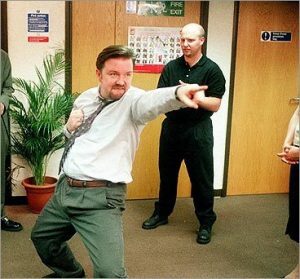 Compare this to ‘The Office (U.S)’ and you’ll notice the same kind of humour, but with more quirky, loud and larger than life characters. Macabre is having the quality of grim or ghastly atmosphere, this entails dark humour or black comedy. The term black humor (from the French humour noir) was coined by the Surrealist theorist André Breton in 1935 while interpreting the writings of Jonathan Swift. Breton’s preference was to identify some of Swift’s writings as a subgenre of comedy and satire in which laughter arises from cynicism and skepticism, often relying on topics such as death. Scholars have associated black humor with authors as early as the ancient Greeks with Aristophanes. Sarcasm is the use of irony to convey. It’s often a sharp, bitter or cutting remark manifest chiefly in vocal expression. This means it’s often the tone of voice which can imply whether something is sarcastic.Professionals in psychology and related fields have long looked upon sarcasm negatively, particularly noting that sarcasm tends to be a maladaptive coping mechanism for those with unresolved anger or frustrations. Psychologist Clifford N. Lazarus describes sarcasm as “hostility disguised as humor”. While an occasional sarcastic comment may enliven a conversation, Lazarus suggests that too frequent use of sarcasm tends to “overwhelm the emotional flavor of any conversation”.